For some reason, packing any dessert into a personal serving size boosts its appeal. Seriously, cupcakes are WAY more fun than cake; it’s like 2 dozen parties instead of just one! With that in mind, I set out to make dessert ravioli. I had two ideas brewing, but by a unanimous vote (Lucas only), personal apple pie ravioli with warm caramel sauce won. This concept arose mostly because I was eager for an excuse to use my ravioli maker attachment. Well, as it turns out, flakey, delicious pie crust dough does NOT like the pasta-maker and crumbles at the mere sight. No sweat, though, I just hand pressed the ravioli. After baking these apple pocket treats, we discovered they looked less like ravioli and much more like little personal pie puffs (the best word we could find to describe the creation – notice that Lucas gets an honorary inclusion in the baking process by proximity from the couch to the stove). Let me rephrase: totally delicious personal pie puffs! O man, these baked goods are out of this world. I didn’t even need to make the caramel sauce, but the combination was scrumptious. I’ll surely be baking these pastries as a finger food dessert for a party in the near future; in fact, maybe I’ll throw a party just so I can bake them. My only homemade apple pie attempt happened earlier this year when I decided to bake Margot’s favorite pie as a going away treat. I’d never baked an apple pie before and wasn’t in the mood to follow a recipe (I used at least five different types of apples and threw in a couple of pears because that’s just want I wanted to do and Martha couldn’t convince me otherwise). The crust puffed up tall, while the filling sunk; when I cut into it, the insides were still a tad runny and the apples slightly crunchy. I still thought it was delicious and ate it without complaint, but it wouldn’t have won any awards at the county fair. Margot, if you’re reading, these apple pie puffs are in your honor; they could definitely compete with grandma’s old-fashioned apple pie. I’ll make it up to you one day, I promise. 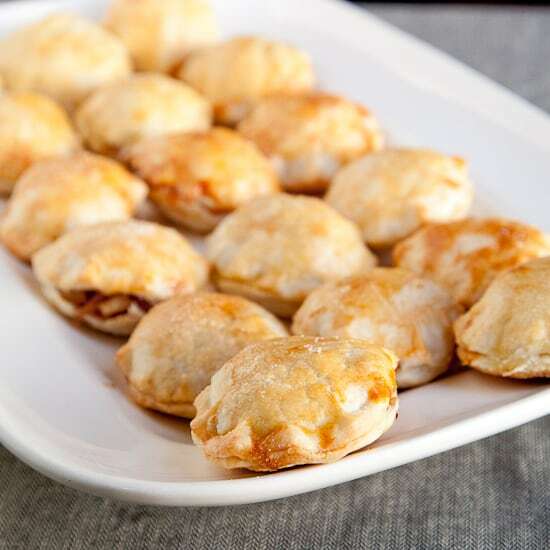 For these bite-sized puffs, I decided not to make my own pie crust (even though they certainly would have been even better with a homemade crust) because we were short on time (we slept in half the day). Instead, I used two Betty Crocker’s boxed just-add-water pie crusts; I didn’t want to fuss with a handmade crust (nor did I have the patience to refrigerate it for an hour beforehand). Did I mention that I burned myself? AGAIN! This time it wasn’t my fault at all – the hot-off-the-stove caramel sauce dripped off the spoon and landed splat between my index and middle fingers. Listen when I tell you, this stuff is HOT; stir with caution. This incident is a perfect example of the reason why I will never deep fry anything in my kitchen. Ever. Mark my word, and if I ever tell you otherwise, something’s gone horribly wrong. 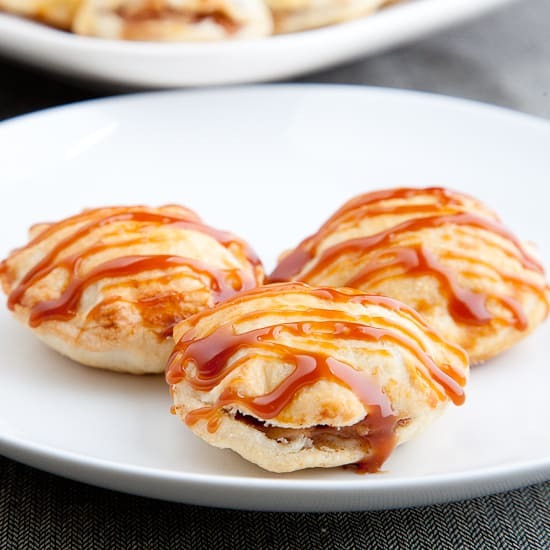 I’ve raved about the pie puffs, but I should really give the caramel sauce its moment; I never realized just how easy it was to make luscious caramel sauce. Actually, If I’m being candid, I’ll admit that I had to make two batches because I let the sugar cook 5 seconds too long and burned my first batch just slightly. For the second try, I watched the color like a hawk and the instant my thermometer even looked like it was going to rise from 310ºF to 320ºF, I removed the pan from the heat. 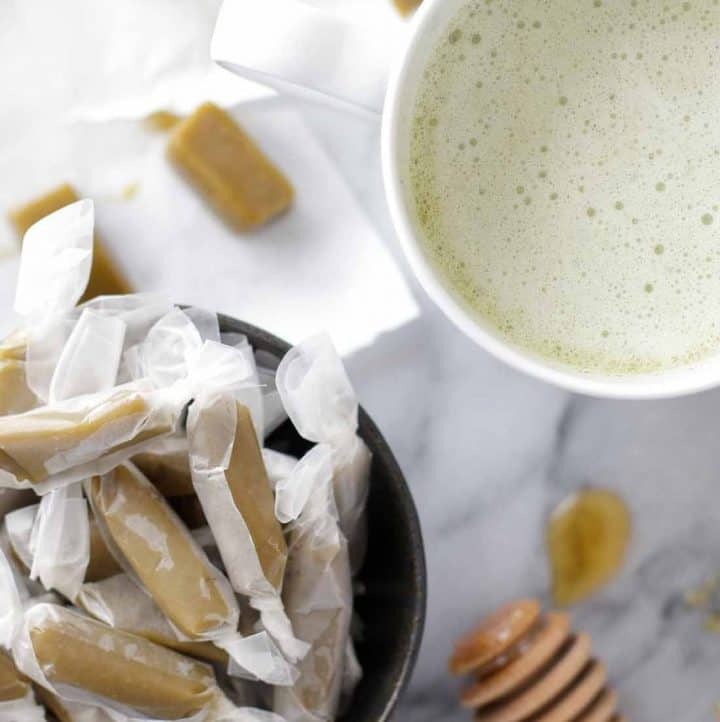 With the blink of an eye, your perfectly sweet and flavorful caramel could turn into bitter burnt sugar. This second attempt was a great success and put Smucker’s jarred caramel sauce to shame. Melt butter in large pan over medium heat. Add apples, sugar, cinnamon, salt, nutmeg, cloves, and lemon juice. Cook, stirring, until apples are softened to your preference, about 10 minutes. Remove from heat and stir in flour. Cool. Roll out pie crust and use cookie cutter or cup to cut 2-inch circles. Brush egg on inside edge of ¾ of the circumference of the circle. Lay another circle on top and press the edges together where egg is to seal, leaving an 1-inch opening at the top to fill. Place a tablespoon (more or less) of apple filling into the pocket, and press pocket closed. Crimp edges with your fingers. Lay on a parchment lined baking sheet. Brush tops of pie puffs with egg wash and sprinkle with sugar. 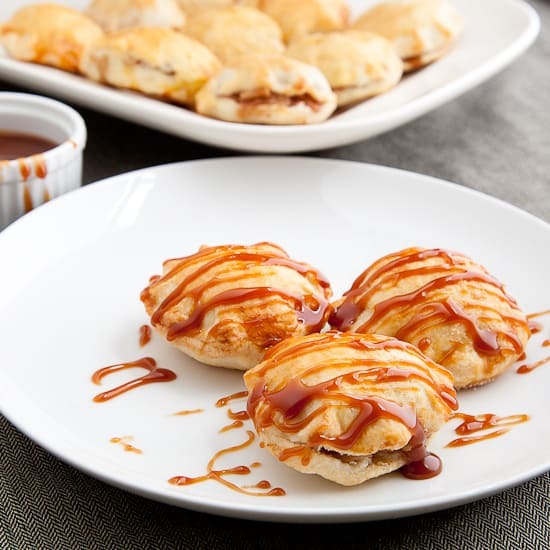 Serve with warm caramel sauce (recipe below). Measure out cream, butter, and salt and keep them handy. In a 2-quart saucepan, add water and sugar, making sure that sugar is not stuck to the side. Turn heat to medium high, and insert candy thermometer. As sugar starts to melt, stir to make sure sugar distributes evenly. Stop stirring and continue cooking. Watch CAREFULLY. As soon as the mixture begins to turn color, it will change very fast. Just as the candy thermometer reaches about 320ºF and the caramel is an amber color, remove from heat and pour in cream all at once (Stand back as it will react and sizzle quite a bit). This stage is key, if the caramel gets too dark before you remove it from the heat, it’ll taste burned and bitter. Add butter and salt. When the sizzling calms down, return to medium low heat and cook, stirring constantly, for 3 minutes. Pour into a cup or bowl and let cool a bit before serving. Can I be invited to the party? cuz these look delicious! Mmmmmmmm!! I made some cherry pie pops the other day! Yours look fab! Love the caramel topping! Thanks! Yours look delicious too. Adding the stick is such a good idea. These look amazing! And you’re right – bit size anything like, tripples the treat factor! 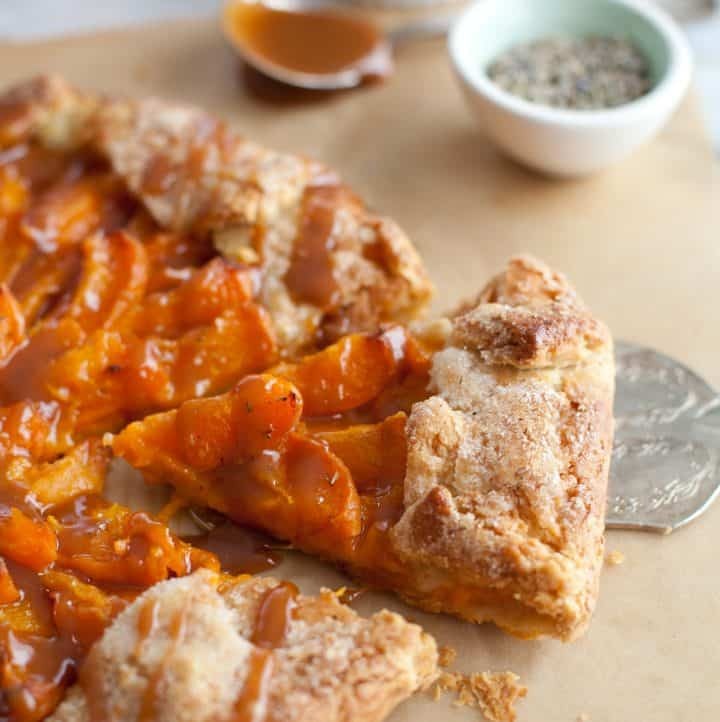 A great recipe for apple lover like me. Thanks for sharing your recipe. In the ingredients for the sauce, what kind of cream are you talking about? I used heavy whipping cream. Found in the dairy section, near the milk. You mention two different temperatures for the caramel sauce. When describing your experience you used one temperature, and the recipe a different one. Could you clarify which is correct? I have turned fudge into a brick because I read the thermometer wrong, I wouldn’t like to repeat that ;-) Thanks! 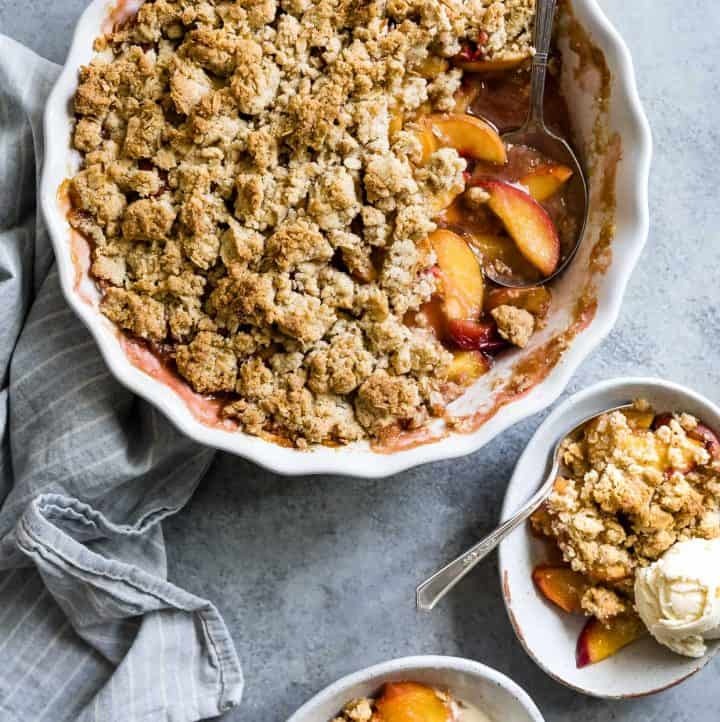 I just baked a bunch of these for my husband on his birthday because he loves apple desserts, and he wouldn’t stop raving about them! I was pleasantly surprised that he said they taste like McDonald’s apple pies (he assured me that this is actually a very good thing) but better, because I’ve never made apple pie before. But this was such a nice, easy recipe to follow, and the pielets (which is how we’ve referred to them) turned out pretty tasty. So, thanks a lot for this post, along with all the other great posts on your blog! Keep up the good work; I love browsing on here! These look really tasty. The caramel topping is what makes it pop. 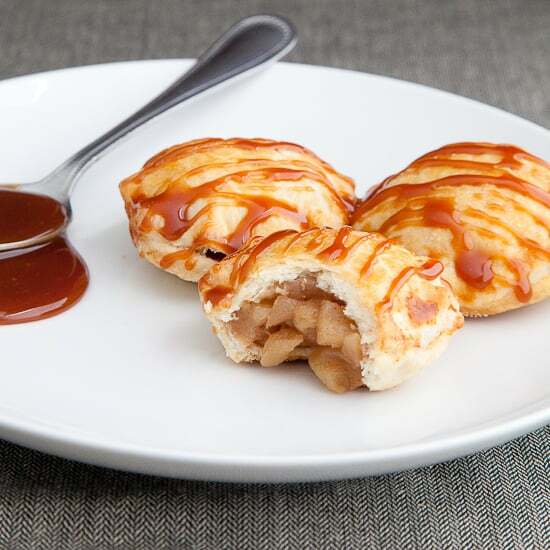 Anything with caramel sauce makes my mouth water! Wish these were on my pre-wedding diet and I could eat them again soon – drats! Im making these for our thanksgiving desert!!!! OO! 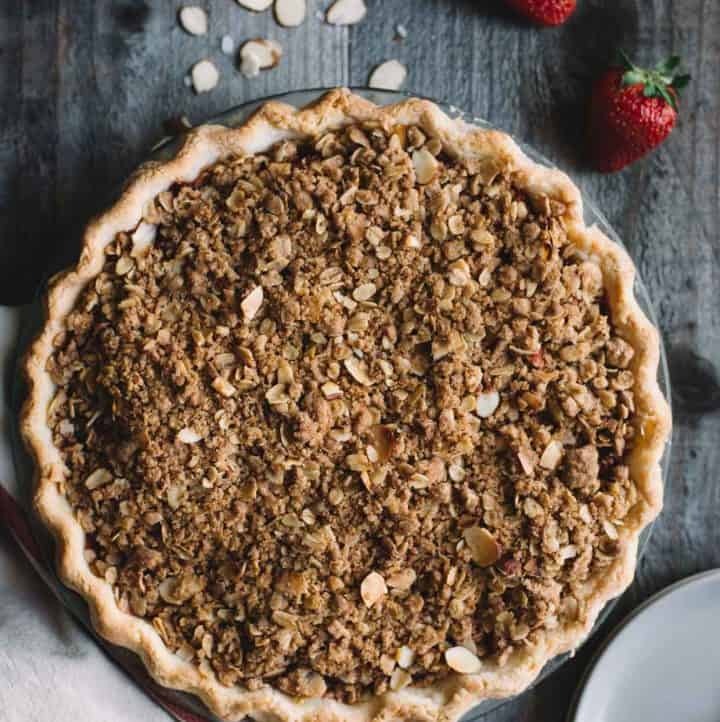 That’s a great idea – sounds like a perfect Thanksgiving dessert! will the caramel sauce freeze and reheat well? I know the pastry will. Thanks. You know, I haven’t tried to freeze the caramel sauce, but I have kept it in the refrigerator for up to ten days and it was totally fine. Just be sure to gently reheat it, but not boil it. I’ve read that you can keep it in the freezer for up to 3 months, and will need to let it defrost over night in the refrigerator before gently reheating. Good luck! Thanksgiving is coming and my in laws have designated me as the cook this year. Not sure if this is because I am going into culinary school or not, but anyway. I saw this and though… hmmm I bet I can make this too! So for Thanksgiving going to be making this! Thanks for the recipe. Goodluck with your Thanksgiving cooking! My mom has decided that this is also my first year learning how to cook the turkey. Wonder how Filo dough would work with these??? They DO look yummmmmy! My only concern with phyllo dough is that it might puff up a ton and I’m also not certain if the edges would hold all the filling in. If you give it a try, please report back the results – I’d love to know if it works!